Paint Inspections in Melbourne Victoria – Specialist Paint Inspections, any where, any time! For those times when only a Totally Independent Paint Expert will do! Specialist Paint Inspections, any where,any time! Paint should not fail early, there is always a reason and it may not be the paint! All paint has a natural life expectancy. If you paint if failing early, it may not be the paint itself that has caused the premature breakdown. One of the legacies for buildings built before 1972 is that the paintwork, that is oil-based paints, that we used on the house or any building will contain lead. Lead paints were available up until 1972, following that time any domestic paint had to be manufactured lead free. 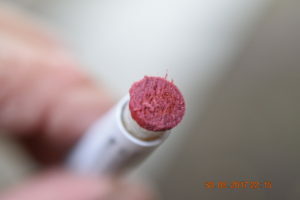 There is a test that can be carried out using a lead testing kit that will provide an answer as to whether or not the enamel paint in your home contains lead. The first picture the result of a lead test that proved positive, tip on the testing vial clearly shows that there is lead present the coating. The second picture shows the area that the test was taken which was in this case exterior windows on a building built in 1960. 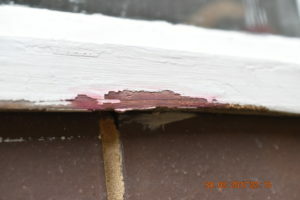 The problem here was that the existing paint system had failed exposing the lead laden oil-based paint underneath and when re-coating was to take place it meant that sanding back all the way to remove the old and flaky paint would expose the lead paint and therefore safety issues that can occur. Red means Lead, a simple test with a lead testing kit will confirm the presents of lead paint. These external window frames were tested and lead based paint was found to be present. No with proper processes the old paint can be removed without creating dangerous lead dust thus avoiding potential health risks to the home owner and their children.